The Tamar Valley branch is poised for a secure future with talk of a reopening to Tavistock. Mike Fenton looks at the history and current operation of this scenic line from Plymouth to Gunnislake. LOOK at any railway route map of the far west of England and you are immediately aware of several tributaries to the old GWR main line – the surviving Cornish branches. Four serve populous, thriving resorts – St Ives, Falmouth, Newquay and Looe – but the most easterly, the Gunnislake line, linking the western suburbs of Plymouth to the Tamar Valley and the Bere Peninsula, crosses the Cornish border at Calstock and climbs some 500ft to a dead-end, single-platform terminus in the locale of Drakewalls, with the village which gives its name to the station being a mile down a steep hill to the east. Compared to its better-known westerly contemporaries, this line is one of the railway network’s best-kept secrets. It was years after I first experienced the other Cornish branches that I was able to create an opportunity to visit this 15-mile line emanating from Plymouth. Once I did, I discovered almost a parallel universe and was forever smitten, beguiled by a hinterland rich in industrial archaeology and a captivating journey full of contrasts, with its luxuriant wooded slopes, derelict chimney stacks, panoramic river views, and high-aspect vistas of west Plymouth. The Gunnislake line is an anachronistic branch-line survival, but also a thriving artery, which owes its modern existence to a unique set of geographical and sociological factors. Two statistics succinctly explain the line’s continued survival and contribution to the life of this beautiful area – 85% of the Bere Ferrers parish boundary is water, and the distance between Bere Ferrers station and Plymouth is seven miles by train, as compared with a 28-mile journey by bus. Better the delights and reliability of the train journey than running the gauntlet of the A386 in peak-hour traffic. The Tamar Valley always was a special case, so much so that even the ‘Beeching axe’ never seriously threatened it – there simply is no alternative to the train. It remains the only branch on the national network not to serve a town at its terminus. In truth, the Gunnislake line is not a branch railway per se, being a group of surviving fragments of earlier railway entities which find themselves conjoined by modern requirements and which reflect some of the Plymouth area’s fissured railway past. You travel on the former GWR route at the Plymouth end, the central section being the singled remains of a former LSWR main line, and its northern end is the surviving section of a branch which once served the Cornish town of Callington. Worth a visit for the majesty of Calstock viaduct alone, the line thrives with a regular diesel service provided by Class 150 two-car units, based at the Laira depot in Plymouth, and with moves afoot to reopen the line to Tavistock, which would render the station at Bere Alston once again a junction, the future appears bright for the Gunnislake route to take on a wider role. The line’s origins grew from the need for the quarries and mines around Kit Hill and Callington in the latter half of the 19th century to find a ready outlet for their stone and copper, and to this end the East Cornwall Mineral Railway (ECMR) opened on May 7, 1872. Built to 3ft 6in gauge, it ran seven miles from Calstock Quay, on the Tamar, to a terminus at Kelly Bray, a mile from Callington. There was a cable-worked incline to surmount the steep cliffs above the quay, the Incline station being 350ft above the river, with the remainder being loco worked. On June 2, 1890 the Plymouth, Devonport & South Western Junction Railway (PDSWJR) opened its line south from Lydford to Devonport, the line being worked by the LSWR from the start. Running from Tavistock across the Bere Peninsula into Plymouth, this heavily earthworked route included a major bridge over the Tavy, and it was the construction of this line which was to eventually bequeath the nucleus of the modern surviving branch, spawning a prosperous market gardening industry which was to flourish for decades with its direct link to London via Okehampton. In 1894, the PDSWJR took over the ailing ECMR, an objective to which it had agreed in its main line Act, and under Light Railway Orders of 1900 and 1905 extended the line over the Tamar, initially in the narrow gauge of the former mineral railway, but after work had started the decision was taken to build the new route in standard gauge, under the supervision of Holman Fred (later Colonel) Stephens, famed as owner of a scattered network of impecunious railways, who was appointed by the PDSWJR as on-site engineer to supervise the upgrading of the old line, design the stations and order the rolling stock. In order to find easier gradients on the Cornwall side, a feature of the new course was the huge horseshoe loop through Harewood to link up with a new station at Calstock. Even so, gradients here ran to 1-in-37 and in steam days the climb to Gunnislake would seriously tax the Callington-based crews. Today, as the diesel grinds its way up onto the last two miles to the terminus, the line’s mineral traffic origins are reflected in its tight narrow formation, with steep drops on one side and high cutting walls on the other. Crossing the Tamar on the majestic Calstock viaduct, the new line traversed the Bere Peninsula through steep cuttings at gradients as steep as 1-in-39 to join the PDSWJR main line at Bere Alston Junction. Thus was the Callington branch born, opening on March 2, 1908. Calstock viaduct remains the jewel in the line’s crown, with 12 arches and a height of 120ft above the Tamar. Some 11,148 blocks of concrete were used, and remarkably, contractor John Lang, from Liskeard, chose to build it using overhead cableways rather than extensive timber works built up from the ground. Walking along the banks of the river today and observing the graceful structure which sits so serenely in the landscape, it is difficult to imagine the four years of heavy activity and effort which created it more than a century ago, along what was a very busy waterway, which would have included paddle steamers sailing up from Plymouth crammed with visitors coming to view the progress of the work. The disused inclined plane of the ECMR was replaced by a steam-powered wagon hoist on the western side of the bridge, which was used to move freight between the Callington line and the quay below until it was taken out of use in 1934. Three changes in the 1960s brought about the Gunnislake ‘branch’ as we know it today. Firstly, in September 1964, the war-time connection of 1941 at St Budeaux was brought regularly into use, linking the Western Region metals with the former LSWR/Southern route to Bere Alston. Secondly, the closure of the Callington branch west of Gunnislake on November 7, 1966 now required a re-think in services on the remaining line, especially when the LSWR main line between Okehampton and Bere Alston was severed on May 6, 1968, leaving the latter as a truncated junction, where the modern diesel units have to undergo reversal after the guard has switched the points. The line from St Budeaux to Bere Alston was singled on September 5, 1970. A further change took place on January 31, 1994 when the old island station at Gunnislake was closed and the nearby A390 road bridge, with its low headroom, demolished. The new rationalised terminus was opened on the south side of the road on June 9, 1994. Alighting from a main-line train at Plymouth’s sole remaining main station, formerly North Road with its joint GWR/LSWR identity, you are overlooked by the soulless monolith of BR’s former Western Region HQ, but there are corners of the station which reward closer examination – the very sight of the Gunnislake branch stock in bay platform 3 is satisfying in itself, and there are old GWR platform seats in newly painted brown with their three letters picked out in white relief underneath. Brown WR totems lend an appreciated retro touch, as do the slate-hung walls of the offices and lift-shafts, while tucked away on the oft-quiet oases of the island platforms 7 and 8 are some attractive ‘Plymouth’ and ‘waiting room’ signs in raised sans-serif lettering. In former days, passengers had the disorienting spectacle at North Road of GWR trains for Cornwall and Southern services for Waterloo both exiting Plymouth in the same westerly direction, former LSWR trains for London diverging at Devonport Junction to run north on their own tracks to Bere Alston and Okehampton before turning east for the capital. Leaving North Road on a high embankment you soon see ruins of the Cornwall loop providing evidence of the former triangular junction which provided access to the GWR’s terminus at Millbay, closed to passengers in 1941. Through deep cuttings the first call is at the former GWR station, Devonport (Albert Road). By the time the 117-yard Devonport tunnel is reached the line inclines north, and before the next stop at Dockyard you are aware of being high above the western suburbs of Plymouth, the view west being dominated by the cranes and warships, reflecting the city’s naval history, viewed over rooftops with the Hamoaze glistening lazily beyond. To the east the parallel lines of stepped, chimneyed, slate-roofed terraces emphasise the elevated situation of much of the city. The station at Dockyard is an uninspiring halt devoid of shelter on its Plymouth platform with modest pedestrian access leading into littered back alleys. Such is the contrast here in this dour section of the city with the scenic bliss awaiting the traveller just several minutes away, that during fieldwork for this feature it was a real effort to tear myself off the train at this inhospitable point in order to fully explore the line’s urban habitat! Two minutes’ further on via St Levan’s viaduct is Keyham station, hidden away amid Victorian terraces and cream-washed flats, where a line disappears into the docks to the west, a reminder that the dockyard workshops dealt with railway rolling stock repair as well as naval base maintenance. There is a platform loop run-round for dockyard traffic to enable nuclear waste flasks from submarines to be accessed and removed. Ferry Road station visible round the curve to the left on the Western main line, the branch service passes over the connection laid in the Second World War to enter Southern territory. In St Budeaux Victoria Road station the driver opens the token box on the platform and rings Plymouth ’box to request release of the token which will give the crew the authority to proceed on the single track branch. The old down platform here is a trackless wasteland – the concept of up and down is somewhat confusing, but you have to remember you are on the old LSWR route now, on which you would have been heading in the London direction when it was possible to do so, hence the disused platform was the ‘down’. St Budeaux, and as the track burrows beneath the main GWR line you are almost at river level as the Tamar appears on your left. Passing beneath the Tamar bridges, Brunel’s Royal Albert Bridge of 1859 and its suspension road counterpart of 1961, there is a tangible feeling of passing from one world to another as the train picks up speed on Tamerton flat. The most express-like moments of the journey are experienced on this section through to Bere Ferrers, and you get a sensation of great release as you escape the urban clutches of Plymouth and enter a moister, fresher world of river valleys and pastoral landscapes. Following the banks of the Tamar, the Ernesettle MoD armament depot is visible to the right, rarely used these days judging by the rusted tracks visible, then an inlet of the Tamar is crossed via Tamerton viaduct and you pass the denuded remains of Tamerton Foliot Halt, closed in 1962. The confluence of the Tavy and Tamar rivers is visible to the left as the train crosses the mouth of the former on the PDSWJR’s Tavy viaduct, built between 1888-90. Best appreciated from the rivers, with land access not easy from either direction, it has masonry arches supporting the approach from either side with the main sections of the bridge comprising eight bowstring girders, each 120ft in length. Once on the Bere Peninsula the line alternates between deep cuttings and heavy embankments, giving tantalising glimpses of the rivers on either side, the Tamar meandering its way north towards Calstock and to the east the Tavy narrowing upstream towards Dartmoor. The station at Bere Ferrers has achieved a new role through the activities of Chris Grove, a former BR chartered surveyor who in 1980 bought the station buildings and has since developed the former goods yard as the Tamar Belle Heritage Centre with vintage rolling stock, a demonstration line, buffet, restaurant, and B&B and self-catering accommodation. A first-class chef, Chris has well-appointed carriages here which revive memories of the camping coach facilities introduced by the Southern Railway at Gunnislake and Bere Ferrers during the 1930s. The site has become a popular destination for rail enthusiasts and tourists coming to explore the line. The old overgrown up platform sports a restored concrete Southern nameboard amid its prolific growth, while the signalbox, removed from Pinhoe and restored here as an interactive exhibit, bears an earlier spelling of the village – Beer Ferris. A tragic memory ensures the notoriety of this location. The station bears a memorial to 10 New Zealand soldiers killed here on September 24,1917. On a troop train bound for Salisbury, they unwittingly got off the train when it came to a halt and were hit on the down line by an express from Waterloo as it came round the curve. There is a touching irony in the way these young men perished, not on a field of conflict in Europe, but on the way there in a normally quiet Devon outpost. North of Bere Ferrers, the line climbs at 1-in-73 through a series of deep cuttings over the nine-minute run to Bere Alston, where the driver switches ends of the train to take it over the remaining section of the Callington branch, and the guard uses his token release key to alter the point in the ground frame at the end of the platform. The tracks terminate here at the east end of the station, and beyond is the abandoned track-bed of the old LSWR line from Tavistock. Bere Alston station waits quietly between pockets of passenger activity for the new life a re-built line from Tavistock would bring. Occasionally, you see volunteers from a local church at work trying to keep things tidy on the derelict island platforms once used by the Callington branch and London-bound trains. Now on the falling gradient towards the Tamar the train gradually slows for the approaches to Calstock viaduct, then the traveller feels almost airborne as you ride high across the river with stunning views in each direction. Turning east immediately on reaching the Cornish side, the station at Calstock is reached, these days tastefully remodelled. Old photographs show that the station building once resembled in its design some of the buildings on the Kent & East Sussex Railway, reflecting the SER influences of engineer Stephens. A thriving traffic in fruit and flowers once kept the staff very busy here. The remaining 13 minutes of the trip is dramatic and stunning in equal measure as the train negotiates the steeply graded curves of the Calstock horseshoe to the accompaniment of squeaking wheel flanges, and with the driver stopping and sounding his horn for the ungated Okel Tor level crossing in Harewood, it is almost possible to alight at Calstock and find that a brisk walk north towards Drakewalls can put you in front of the train where the track passes the 13th century parish church! Services on the branch cover a long span of a day, with well spaced-out journeys, which reflect the varied passenger usage of the line, its basic pattern of nine trains each weekday beginning with an early train from Plymouth at 05.06 and the last train from Gunnislake leaving each night at 22.21. Saturdays offers the same basic service, less the early train, with five trains each way on Sundays. The needs of commuters into Plymouth, shoppers, schoolchildren and visitors seeking to explore the delights of the Tamar Valley are all considered. Since 1989 there has been partnership working between the local councils, rail industry and the local community to promote and develop the line, and the success of this led to the establishment of the Devon & Cornwall Rail Partnership in 1991, a model which has been emulated in many areas around the country. 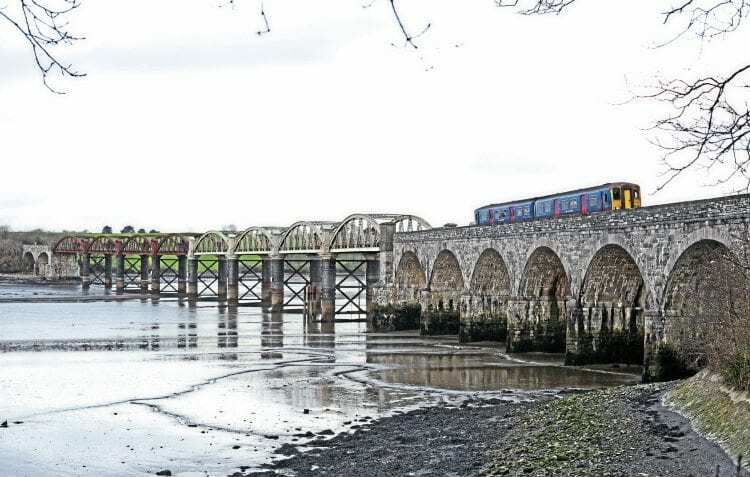 The marketing name – The Tamar Valley Line – has actually been in use since the 1970s. The partnership has enjoyed many successes, beginning in 2001 with the introduction of all-year Sunday services. In 2008, First Great Western put on an extra daily train to bring about Calstock and Gunnislake’s best-ever service. A seminal activity since 2004 has been the Tamar Valley Carnet scheme in which books of 10 discounted tickets, aimed at regular users, but who don’t travel everyday. Sold through local shops, post offices and even a Bere Ferrers hairdresser, around 200 books are bought each month, with in excess of 31,000 having been sold to date. The Carnet accounts for around one in five journeys on the line. A further exciting development will eventually see trains return to Tavistock with the restoration of the LSWR route from Bere Alston. The options will be to operate a shuttle between Bere Alston and Gunnislake or to have a Gunnislake portion on every other Tavistock train. The shuttle option would need a branch platform of its own at Bere Alston, with the Gunnislake unit going on the first train each day, being locked in, then returning on the last Tavistock-Plymouth train. The latter attach/detach option would require new signalling. ■ With grateful thanks to Bruce Hunt, Chris Grove and Richard Burningham.